Do Hair Transplants Work on a Receding Hairline? 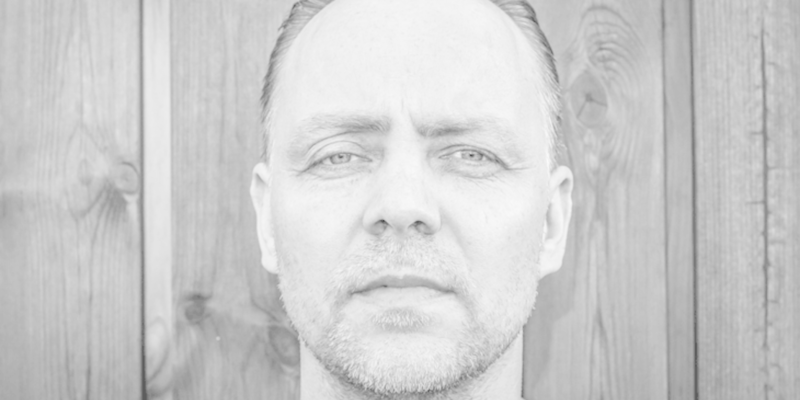 Whether or not a hair transplant will help fix a receding hairline is perhaps one of the most common questions we receive here at the DK Hair Klinik. The (very) short answer, is yes, it will. But the longer answer is a little more complex, as it depends on the cause of your receding hairline and your age. So first, let’s take a scientific look at what a receding hairline is. The hair loss extends over the top of the scalp, leaving behind a patch of hair at the front of the head, with a balding scalp (or very thin hair) behind it. The hair loss extends backwards, leaving behind ‘v shaped’ patches of hair extending from the front of the scalp backwards, whilst the middle front section of hair stays behind. This is sometimes, rather cruelly, called a widow’s peak. Both are classic patterns of male hair loss and are collectively known as male pattern baldness, resulting in a receding hairline, one that is creeping backwards. Most men don’t lose hair from the sides or the back, but a small minority lose their hair from all over their scalp. Either way, doctors and hair care specialists and surgeons refer to male pattern baldness as ‘androgenetic alopecia’. 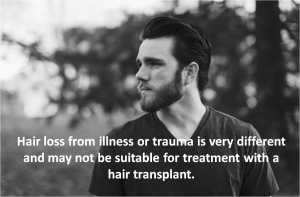 Hair loss from illness or trauma is very different and may not be suitable for treatment with a hair transplant. Broken down simply, baldness or areas of baldness and thinning hair is caused by losing more hairs than you produce new ones. Shedding hair is a normal biological process which happens to all of us, male and female. Normally, if we have healthy hair follicles, we produce new hairs to replace the ones we’ve shed. It’s a continual process, with each hair capable of growing for around three years before being shed. But once hair follicles become less healthy, they become smaller and subsequently produce much thinner hairs, and eventually stop altogether. Of the hairs that are produced, their lifecycle is much less than three years. Age is an inevitable cause of a receding hairline. Around half of all men will experience some level of hair loss by the time they reach 50 years old. For some, around 30%, they will experience a receding hairline earlier, by their late 20s or early 30s. But a receding hairline cannot simply be put down to getting older. There are far more complex biological processes at play. Namely, hormones. Those things we can thank for many of the troubles we humans have! The main male hormone, testosterone is converted into another hormone, dihydrotestosterone. It’s this second hormone that has the negative effect on the hair follicles, causing them to shrink over time. Genetics are also at play, and hair loss is often seen running through families. So now we understand the causes of male pattern hair loss, we can return to our original question, that of how successful hair transplants are on a receding hairline. As we mentioned at the beginning, generally, a hair transplant is an excellent treatment for a receding hairline. Here at the DK Hair Klinik, we carry out many expert hair transplantation procedures, all using the superior Follicular Unit Extraction, or FUE, method. This method involves extracting individual hair follicles from around the back of the scalp where they’re at their strongest, and individually transplanting each one back into the front of the scalp. This effectively ‘fills in’ the receding hairline. Our expert surgeons will always discuss the sort of hairline you wish to achieve from your hair transplant and will mark it onto to your scalp to show you how your hairline will look. This also gives them a ‘template’ to work to. Depending on your level of hair loss, you can choose to go back to your original hairline, or you can choose to have your original hairline improved if it wasn’t too even to begin with. You can discuss all of that with your surgeon. If your level of hair loss is great and your surgeon doesn’t think you’d have enough healthy hair follicles at the back of the head that could be harvested to take you back to the hairline you had before hair loss, then your new hairline may have to start a little further back than you originally had in your younger years. But nevertheless, your hairline will still be dramatically improved. If you’re suffering male pattern baldness and your hairline is beginning to recede, you may be keen to have a hair transplant as soon as possible. Which is understandable, losing your hair at a young age can be upsetting and cause issues with confidence and your self-esteem. Especially so if you’re the only one in your peer group who is losing their hair, or if you depend on your hair for work such as in modelling, acting or singing. However, male pattern baldness is likely to be a progressive issue. Say you noticed a receding hairline in your 20s and you had the front inch or so of your hairline treated. Unless you take medications such as Propecia or use daily topical solutions such as Rogaine/Regaine for the rest of your life to stop your hair loss, then it’s likely that your hair loss will continue. Because the very nature of a hair transplant is to use the strongest hair follicles, these transplanted hair follicles are unlikely to ever become unhealthy and stop producing hairs. If you think about it, its rare to see a man that is completely bald, unless he shaves his entire head. Hair usually still grows around the back of the scalp, where the strongest follicles are taken from. Therefore, you could find yourself in a position a few years after your hair transplant where you have a healthy growth of hair at the back of the head and at the front where you had your transplant. But, in-between this area you could be thinning and eventually balding, as your natural hair loss continues. This results in a patchy, uneven head of hair. The answer? Another hair transplant. Many, many men go into their first hair transplant knowing that it won’t be the last, and find this perfectly acceptable, in order to have a life of uninterrupted good hair. In fact, it’s perfectly normal here to see men coming in for second and third hair transplants. Obviously, this does mean extra cost and time in the hair surgeon’s chair, but many men think this is worth it. What’s important though, is to be aware of this, and to only see expert surgeons who will inform you of everything you need to know. So if you’re looking to treat your receding hairline with a hair transplant, contact us today!